Quickly and easily take gravity readings of your unfermented wort or wine must, with only a couple drops. Measures in Brix and Specific Gravity. 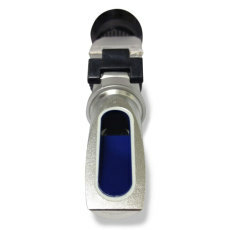 A refractometer measures the gravity of unfermented wort and wine must, and is a great device for both the home beer and wine maker. Refractometers differ from hydrometers as only a few drops are required for each sample. To use, simply apply 1-2 drops of your wort/must to the device prism (clear glass on the front), close the daylight plate (plastic cover) and press lightly so the liquid covers the entire surface, then look through the lens while aiming it at a light source. This refractometer provides gravity readings in both Brix (0-32% +/- 0.2% accuracy) and Specific Gravity (1.000-1.120 +/- 0.003 accuracy). The device also has automatic temperature compensation (ATC) for temperatures ranging between 50-86 F (10-30 C), so no need for correcting the reading based on what temperature your liquid is - it does it for you. The readings will only be accurate before fermentation, as the presence of alcohol will throw off the calculation. 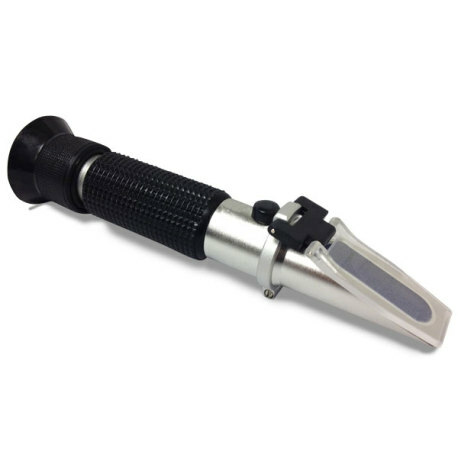 The refractometer comes in a protective carrying case and includes one eye dropper as well as a small flat head screw driver for calibration. Picked this up at GF on brew day as I broke my hydrometer......again. Made checking my mash gravity much easier. Just a heads up, but this (and any refractometer for that matter) will not be accurate once there is alcohol present. I purchased the refractometer to give as a Christmas gift. The item was delivered quickly and well packaged. The device comes in a nice hard case and is nested in soft padding for safe storage. The latch on the case was broken off upon arrival but the gift recipient didn't mind. I hate hydrometers! Too much sample volume, too many spills, too hard to read, too much clean-up. So I decided to give this refractometer a try to measure the alcohol content of my beer using just a two-drop samples. I know that you can read OG directly from a refractometer, but I also know that the FG reading will be wrong because the alcohol in the fermented wort interferes with the refractometer's gravity reading. 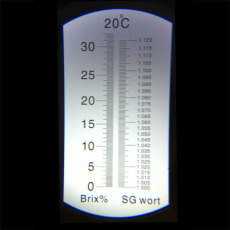 But I recently heard that if you measure Brix (rather than gravity) with a refractometer, before and after fermentation, you can mathematically convert to the original and final gravities, corrected for alcohol interference. To test this, I made a batch of beer and took OG and FG readings with a hydrometer, and original and final Brix readings with this refractometer. Then I used the Refraco App downloaded from the Apple App Strore to do the Brix conversion. 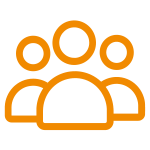 (There are also online Brix converters you can find with a Google search.) The bottom line is that the OG and FG values calculated from the Brix readings were only 0.001 lower than the hydrometer readings, and subtracting OG from FG for both methods gave EXACTLY THE SAME VALUE! So I'm convinced! I won't be using a hydrometer anymore. My only criticism of this product is that the instructions were badly translated into English from Chinese and are barely intelligible. But the instrument is fairly simple, so you can pretty much figure out how to use it without the instruction sheet.